South Africa coach Peter De Villiers has chosen to accentuate the positives after his side's Tri-Nations victory over Australia, admitting that he couldn't understand the penalty count against them at the scrums. Referee Bryce Lawrence penalised the Springboks regularly in the second-half, the visitors conceding 15 penalties to Australia's four, but De Villiers focused on their successes and insisted that other facets of their game would fall in to place. "It was a brilliant performance. We didn't have the platforms to play with that we wanted, but we still managed to play with the ball that we had, our defence was very good, our kicking game was outstanding as it always is and then we passed the ball around to score four tries," De Villiers said. "There are a few things to work and we will study the video to do that, and there's always room for improvement in this team. "We didn't have what we wanted especially from scrums, so we will go and study the video to see why. I couldn't understand it, but then again the character of the team stood out and the fact that we are working together as a unit makes me feel pleased with the result. "Most of the stuff we worked on worked and we have a 75% success rate. I don't think we'll focus on the negative. We will focus on what we did right and then add the other stuff to our game." Springboks skipper John Smit was singled out by Lawrence on a couple of occasions, but the veteran front-rower couldn't understand the referee's decisions. Smit's men now have a week to work on their scrum ahead of the return fixture in Brisbane on September 5. "It was a bit of a lottery out there to be honest and sadly the numbers weren't coming up for us. The scrum penalties were frustrating and it's not something that we are used to giving away. 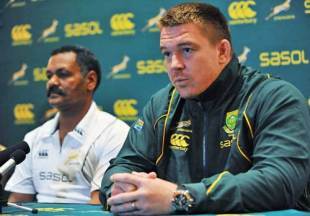 It was quite bizarre and it did debilitate our momentum for some time," Smit said. "At half-time, we spoke about buying another half-metre just to make sure it was even easier for the referee to make sure we were onside and it's an area we will have to look at so the referee doesn't have the opportunity to penalise us."